Home News Smartphones Software COMELEC Halalan 2013 App for Android devices now available for download! COMELEC Halalan 2013 App for Android devices now available for download! 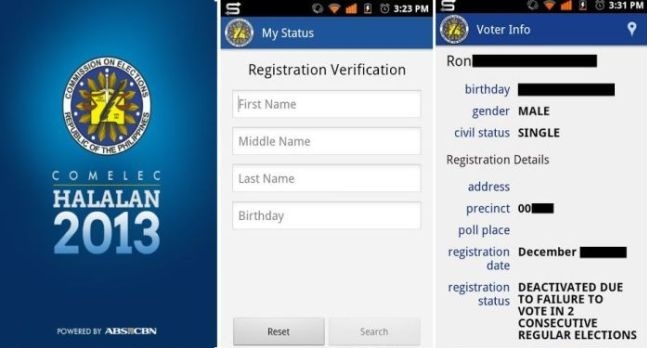 The COMELEC Halalan 2013 mobile application (COMELEC App) created by ABS-CBN aims to allow the public access to election-related information and services through mobile phones and devices. It allows a Filipino voter to check the status of his registration and eligibility for elections, assists him in locating his precinct or polling place, and provides him with information and news related to the coming 2013 Philippine elections. More details after the jump. Seen as the "ultimate mobile tool" for the upcoming 2013 mid-term elections and future national polls, Comelec app, aims to empower Filipinos by providing a comprehensive array of election-related information, and the capacity to report issues to push for community reforms. The Filipino voter will find the app useful in the long-term, as it has several features which include a Voter Status Checker, where users can check the status of their registration and eligibility for the elections; a Precinct Finder, which will assist voters in locating their precinct or polling place; and Halalan 101, which will provide the public with vital information regarding the elections, such as important dates and polling instructions. Leading up to the voting period, users of the Comelec app will also be able to access the Candidates List, which shows a list of candidates for national and local positions including party list organizations; and Election News, which contains updates from Comelec and ABS-CBNnews.com. Through the BMPM Report feature, citizen journalists can submit reports, photos and videos to Bayan Mo, iPatrol Mo. The Election Results feature, meanwhile, will provide updates on the progress of vote counting or tabulation from sources designated and/ or authorized by Comelec. The app, made possible through the partnership of Comelec and the News and Current Affairs Division of ABS-CBN, is also set to be launched soon for Apple devices. Download the Comission on Elections (Comelec) Halalan 2013 mobile app powered by ABS-CBN for free from the Google Play Store.